David Yancey teaches a music-based physics lesson Wednesday, April 26, 2017 at Temple of Faith Deliverance Church. By day, David Yancey is a nuclear engineer and workweek manager at the Sequoyah Nuclear Plant in Soddy-Daisy. At night and on weekends, he is a parent to six children, two of whom are foster children, ages 17 and 16, he and wife Ayanna are raising with their own four kids, ages 13, 9, 4 and 2. To help fill his spare time, and because he finally came to terms with never becoming an NFL star, he began teaching himself to play guitar about six years ago. Two years ago, he created a program for young people in his church called Math Is Art. Since then, he has adapted the program to use the guitar as a way to teach certain physics principles such as tension, wavelengths, pressure and force. He has three middle-school-age students currently studying the concepts. He stresses that while the idea to show how math and science are part of our daily lives, "the focus is on fun," which for some might seem to be a triple oxymoron since fun is rarely found in the same sentence as math or physics. No matter your preconceived notion of what a nuclear engineer might look and act like, Yancey, 32, likely doesn't fit that image. He's young and good-looking with a friendly smile and long dreadlocks, and he likes talking to and being in front of people. "He is a very successful and a cool young man," says Lee Hearn, a deacon at Yancey's church, Temple of Faith Deliverance Church of God in Christ in East Lake. Hearn says Yancey is a positive role model for the young people of the church who too often believe you can either be successful or cool, but rarely both. "I think it means a lot to have him as a role model because he has accomplished a lot and is still reachable to them. "He's a stand-up guy and a very faithful man. He is one of the musicians at the church, and he is over the men's group as well. He's just a very humble young man who is willing to step up to the plate whenever he is asked." "There are 13 male cousins all a year apart," he says. "We all hung out together." Yancey says he is a fan of jazz and classical music, but to date has learned only to play what he calls neo-soul. He also writes lyrics for his original numbers. "Sam Cooke and Otis Redding-type stuff," he says. "Jazz is the ultimate goal. It is very free-form, but there are rules to master. I need to learn to play well first." He has played a few public engagements, including a show at Sugar's Ribs downtown before it closed. That was in part thanks to encouragement from Chattanooga Songwriters Association founder Thom Cavin. "He really helped me," Yancey says. His next public appearance will be June 14 as part of the Noontunes series at Miller Plaza. He will be joined by fellow TVA engineers Justin McBath and Xavier Cotto on bass and drums, respectively, and Evron Stewart, a Southern Adventist University student, on keys. "We don't really have a name, but I'm pushing toward D.L. Yancey and Soul Therapy," he says with a grin. Even Yancey admits to being a little different than some other engineers. "I like people. I like interacting with people." So where does a nuclear engineer go to learn to play guitar? "I learned from YouTube," he says. "There is so much out there." He is also using the internet as a resource for finding ideas for his Math Is Art series. "There isn't anything else out there that I've found" similar to his program, he says. He's hoping to perhaps work with other local scientists and musicians to further develop the program. He says he is adamant that the sessions be hands-on and fun and not school-like. "I'm big on application," he says. "We talk about things like tension when tuning a guitar or sound waves." 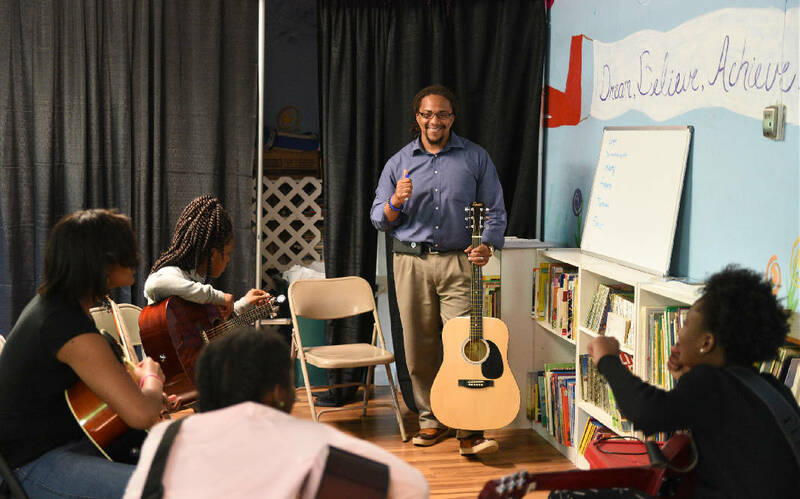 He says music is very much about math and he stresses to the students he works with, "If y'all are musicians, there are no excuses for not doing well in math. I don't want to hear it," he says with a big smile.